The Grill at the Former Four Seasons Opens May 2Can the Major Food Group do for mock-turtle soup and Amish ham steak what it did for rigatoni alla vodka? The Four Seasons Invented the Power Lunch. Can It Be an Actual Food Destination?The guys behind Carbone try something radical: actually paying attention to what’s on the plate. 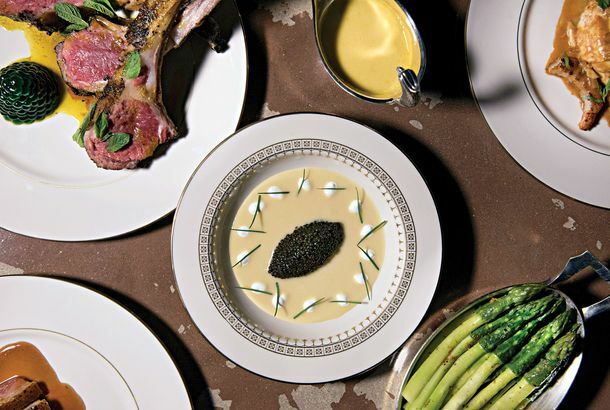 Restaurant Review: Sadelle’sThe feeling you get here, especially at dinnertime, is that Major Food Group is running out of good ideas. 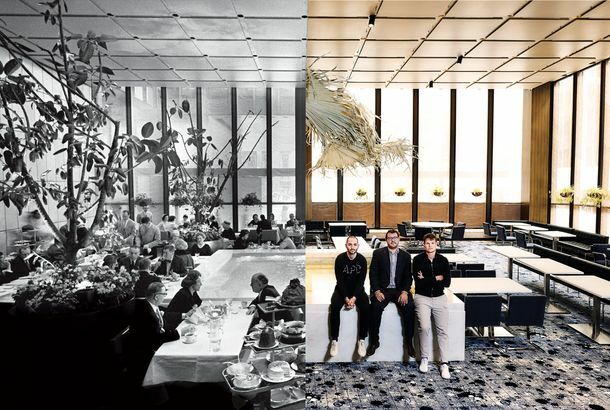 The Carbone Team Is Taking Over The Four SeasonsThe storied restaurant will get a new name and a much younger feel when the Major Food Group assumes control. The Trick Behind Santina’s Guanciale e Pepe Rice“The goal was to invert risotto,” says co-owner Mario Carbone. Parm’s New UWS Location Will Feature a Full Pasta and Entrée MenuPlus 80 seats, a brand-new cocktail program by Thomas Waugh, and a 100-bottle wine list. Dirty French Opens September 2The tarte au citron will be made with preserved lemons. 6 More Things You Should Know About Dirty French, Including Oyster Inspections,There’s lots to learn about this month’s most anticipated new restaurant. What to Eat at Team Torrisi’s Dirty French, Opening Later This MonthDuck à l’orange with ras El hanout and lots more. Carbone Will Open in Hong Kong Next MonthThe restaurant opens mid-August. Torrisi Team Opening Dirty French This Summer“This is an explosive year. All the things that we’ve been working toward are coming to fruition,” they say. Torrisi Partners Opening Ludlow Hotel Restaurant With Sean MacPhersonWhatever it is, it’s slated to open next spring. Parm Opening New Location in Manhattan (and Signs Point to Brooklyn Too)Italian Thanksgiving comes early this year. Team Torrisi Opening ZZ’s Clam Bar on Thompson StreetThe twelve-seat spot is a reservations-only raw bar. Night of the Nonnas: Two Italian Grandmothers Review CarboneBetween them, the women have 95 years of cooking experience. Parks and Rigatoni: Torrisi Team to Open New High Line RestaurantThe 100-plus-seat full-service restaurant will be at the park’s southern tip. Torrisi Team Opening Parm Stand in Yankee Stadium TomorrowA new sandwich stand from the guys behind the game-changing Torrisi Italian Specialties will be open for the rest of the season. Padma Defends Alex Reznik; Smooth’s Closing in Long BeachThe Top Chef host explains it all, while an institution is shuttering in LBC. Alton Brown Disses Sandra Lee; Chili’s Wants Its Customers BackPlus: Bloomberg as Big Brother, and cheap wine, all in our morning news roundup. Food Blogger Splurges for Veselka’s MuralWe’re totally jealous.